← Can the Japanese Yen Forecast the 10-Year Treasury? U.S. stocks mixed as Dow posted its third consecutive record close; S&P 500 Index flat, Nasdaq fell slightly as investors weighed risks tied to North Korea, Republican tax proposal, global monetary policy, Q3 earnings. NYSE trading volume elevated with positive breadth (1.1:1) despite decline in index level. Energy sector rose (+0.5%) as WTI crude oil rally continued, though utilities led; consumer discretionary lagged. 10-year Treasury yield unchanged at 2.20%, while dollar stabilized. CPI data higher than forecast, which precipitated headlines suggesting Fed would be more aggressive. Few expect a hike next week, but Fed funds futures show ~55% chance of December hike, up from 35% last week. Commodities – WTI crude oil +0.8% to $49.70/bbl., COMEX gold +0.3% to $1332/oz., industrial metals’ weakness continued across the board; copper -0.2%. Asian stocks up for first time in three days, led by KOSPI (+0.4%), Nikkei (+0.5%), which rose as few investors expect change in Bank of Japan’s (BOJ) policy stance at next week’s meeting. European stocks lower midday after another unfortunate terrorist attack in London subway weighs on sentiment, weakness in banks also hurting. STOXX Europe 600 -0.4%. Pound rally continues on Thursday’s hawkish BOE comments, appears unfazed by terror attack. U.S. indexes open mixed, but little changed as traders digest overnight geopolitical events. Safe havens such as gold, yen down this morning, despite North Korea, London. U.S. dollar weakening vs. most major currencies. Commodities – WTI holding steady ~$49/bbl., as is gold ~$1329/oz., industrial metals lower. North Korea fired another missile over Japan last night, enforcing the notion it has the ability to bring Guam into play. This was the 12th North Korean missile fired this year, and investors appear to have largely ignored the most recent escalation. Even the Korean won, which we expect would be most sensitive, was essentially unchanged overnight. Remember the market has historically sold-off immediately on geopolitical crises, yet sometimes not at all, and these incidents have proved to be short-lived, rather than devolve into longer-term, economic events. News is prevalent this morning pertaining to global central bank policy. Our Federal Reserve (Fed) has already embarked on a gradual tightening campaign, but next week we expect no hike but more clarity on their balance sheet reduction plans. Internationally, members of the Bank of England (BOE) have discussed the possibility of rate hikes, particularly since the U.K. is among the only developed markets with annual inflation growth approaching +3.0%, yet Brexit talks persist, and the process is likely to be extremely complicated. Additionally, the European Central Bank (ECB) must contend with Italy’s election next year and Shinzo Abe’s polling data has plummeted. We don’t believe we’re on the cusp of a global tightening campaign, as some would suggest, but we could potentially see a tweak here or there globally. Big week ahead highlighted by central banks. 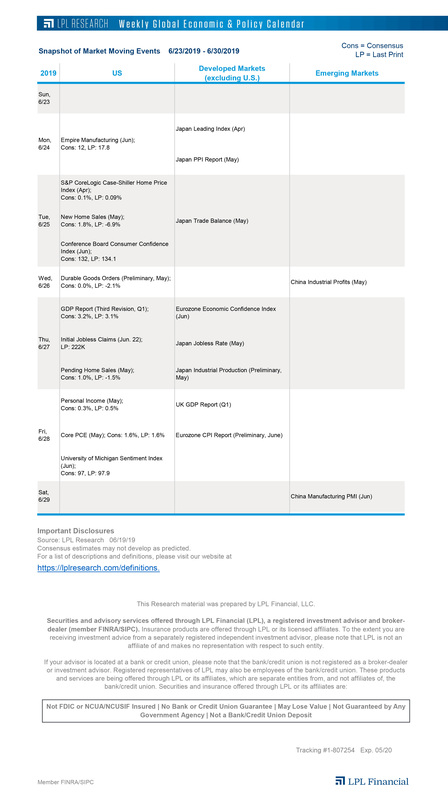 The BOJ and Fed policy meetings Tuesday and Wednesday highlight a potentially pivotal week for markets (9/18-9/22). We expect clarity on the Fed’s balance sheet reduction plans, though we do not foresee a rate hike. While central banks will garner the most attention, U.S. data on housing (homebuilder sentiment, starts and existing sales), current account balance, and leading indicators are noteworthy. Preliminary global manufacturing surveys toward the end of the week will garner some attention as investors will look for clues indicating the synchronized global expansion is continuing. Chinese government’s credit and money supply growth data came in mixed. New lending increased more than expected, but M2 (a broad measure of money supply) grew at its slowest pace since these figures have been reported on. The Chinese economy continues to be uncomfortably reliant on debt and credit, though government policies to curtail credit growth (as opposed to shrinking total credit available) are having some impact. Now that’s boring. The S&P 500 again didn’t move much yesterday. In fact, it traded in a daily range of less than 0.3% for the third day in a row. This has only happened one other time in history (using reliable intraday data back to 1970), and it was in July of this year. It has never had four consecutive days in such a small range.